The Falmouth Chamber Players Orchestra will present music of George Gershwin, Ludwig van Beethoven, and Wolfgang Amadeus Mozart in concerts on Saturday, April 13, at 7 PM, and Sunday, April 14, at 3 PM, at John Wesley United Methodist Church, Gifford Street and Jones Road in Falmouth. John Yankee is music director of this orchestra, now in its sixth year. A reception will follow each concert. 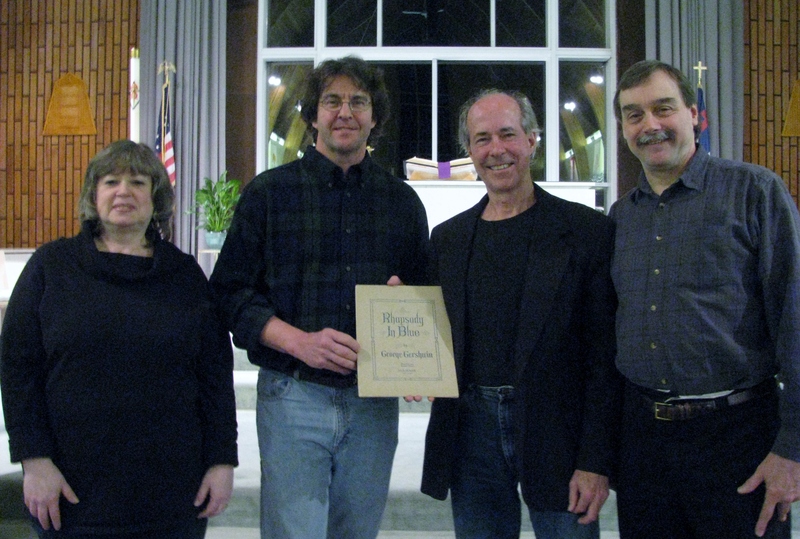 From left to right: Laura Sonnichsen, concertmaster; John Yankee, music director; Robert Wyatt, pianist; and Fritz Sonnichsen, president of the FCPO. John Yankee is holding Robert Wyatt’s original copy of the sheet music for “Rhapsody in Blue,” by George Gershwin. 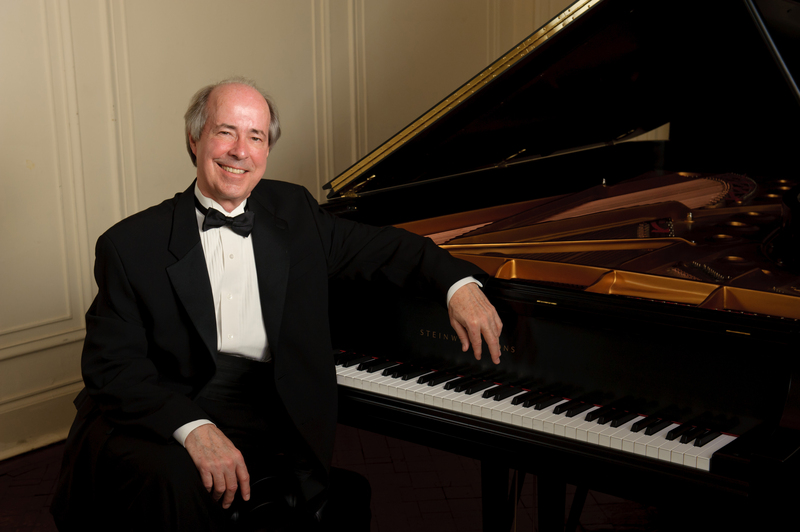 Pianist Robert Wyatt, an accomplished Steinway Artist and noted Gershwin scholar, will perform Gershwin’s “Rhapsody in Blue” with the orchestra. Wyatt is co-editor of “The Gershwin Reader,” the director of music at Highfield Hall in Falmouth, and he lectures and performs throughout the US. From its soaring and sultry opening clarinet glissando through its richly varied piano cadenzas and lyrical themes, to its infectious rhythms and brassy exuberance, “Rhapsody in Blue” captures the vitality and excitement of New York City in the 1920s, melding jazz and classical music into a whole new genre. The February 1924 premiere not only brought the decidedly American genre of jazz into a new era of “respectability,” it also secured Gershwin’s reputation as a composer and introduced the world to what became one of the most popular of all American concert works. The FCPO has expanded its orchestra for this special concert, adding a bass clarinet (Karen Sanborn), “vernacular” instruments, such as a banjo (played by Richard Gregory Allen of Three Cats and a Dog) and adding a second percussion player (Michael Dunford). The concert will open with a performance of Beethoven’s Symphony No. 6 in F Major, the “Pastorale,” a work selected by Laura Sonnichsen, concertmaster and vice president of the orchestra. “The 6th Symphony has always had special meaning for me,” said Ms. Sonnichsen, who has even used its opening measures on her cellphone to identify her husband’s calls. To round out the program, and looking to make effective use of the trombone players who had been added for “Rhapsody” and Symphony No. 6, John Yankee included on the program the Overture from “The Magic Flute” by Wolfgang Amadeus Mozart. The trombone’s slow, sonorous chords are said to represent the solemn knocks on the Masonic temple door. “The Magic Flute” premiered in 1791, just a few months before Mozart died. It is considered one of the greatest works in operative literature, and the overture is full of energy and good cheer. The Falmouth Chamber Players Orchestra includes a mix of amateur and professional musicians from across Cape Cod. The orchestra performs original versions, not reductions, of, primarily, Baroque and classical music. Admission is by donation. The suggested donation is $15 for adults and $5 for children and students. For more information, visit www.falmouthchamberplayers.org or call Mr. Sonnichsen at 508-274-2632.